PLP-F51105 Units: 1 set/ 5 pens total Five food coloring markers: yellow, green, red, blue, and black. Use FooDoodler coloring marker as you would an ordinary marker. Use your favorite sugar cookie recipe or store-bought refrigerator dough. Cut out with your favorite cookie cutter design. 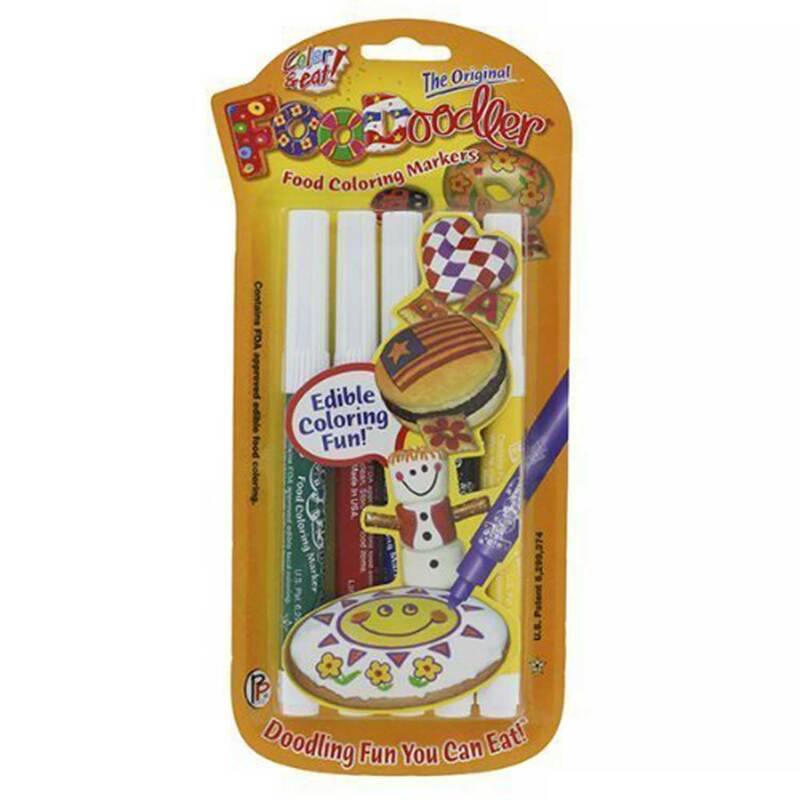 Bake, cool, frost with a hard icing, color with FooDoodlers and eat. Use royal icing (we sell a royal icing mix) and when hardened (overnight or several hours), decorate with the FooDoodler markers. Decorate a plate with a personal message before serving, send a greeting on a lunch sandwich-bread, bagel, cheese & crackers, vegetables, candy and more. After use, wipe tip clean and refrigerate. Please note: These markers have the same tip as Wilton's "Fine" markers, item #609-100, 609-116. Five food coloring markers: yellow, green, red, blue, and black. Use FooDoodler coloring marker as you would an ordinary marker. Use your favorite sugar cookie recipe or store-bought refrigerator dough. Cut out with your favorite cookie cutter design. Bake, cool, frost with a hard icing, color with FooDoodlers and eat. Use royal icing (we sell a royal icing mix) and when hardened (overnight or several hours), decorate with the FooDoodler markers. Decorate a plate with a personal message before serving, send a greeting on a lunch sandwich-bread, bagel, cheese & crackers, vegetables, candy and more. After use, wipe tip clean and refrigerate. Ingredients: Propylene Glycol, Purified Water, FD and C Yellow 5, Yellow 6, Red 40, Red 3, Blue 1, Sodium Benzoate, Citric Acid, Methyl Paraben, Propyl Paraben.